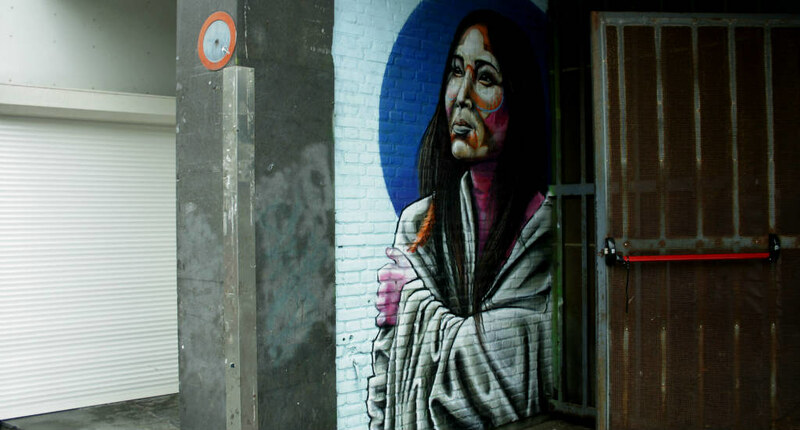 A couple of Dutch cities lead the way in street art, and Rotterdam is one of them. A street art tour takes you along the highlights of the city, as well as some nice lesser known neighbourhoods and hotspots while spotting some excellent murals. Sounds good, doesn’t it? Join me on my street art tour in Rotterdam. I feel like The Netherlands are a bit late in discovering the power of street art. Countries like Belgium Portugal and the US have known for ages, or so it seems, that street art is something more than just graffiti or spray-canned works. Street art can brighten up otherwise dreary neighbourhoods, address local social problems or highlight nature or traditions so typical for the area. But we are slowly catching up. Over the last few years, famous foreign artists have left their mark on Dutch streets, but The Netherlands have also produced some now famous names. 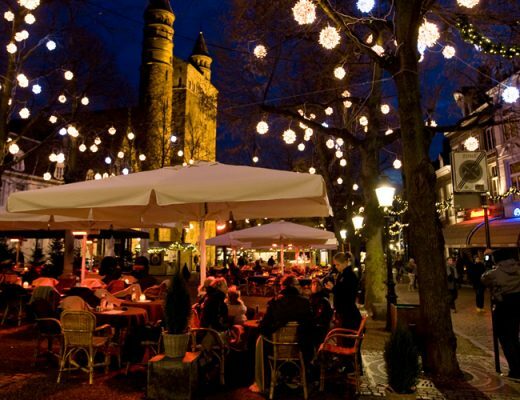 Heerlen, Goes and Breda have hosted street art festivals. And Rotterdam is also an excellent city to spot street art. On weekends there is a street art tour that you can join. It starts at noon at Rotterdam Central Station and takes about three hours. If you’d rather discover the city at your own pace, I highly recommend downloading the Rewriters app. It’s in Dutch, which may make things a bit tricky, but at least you can see where all the murals are. If you follow this route, you will catch multiple birds with one stone: whilst spotting over 40 pieces of street art, the route will guide you along the cities’ highlights, lesser known neighbourhoods and some excellent spots for a drink or bite to eat. A short stroll will take you from Rotterdam central station to Hofbogen, near Rotterdam Hofplein station, where the first collection of street art can be admired. First of all, there’s the three-dimensional work of Rotterdam born Ozon who chose a failed piece of ceramics as a subject for his work. After having coffee at Hofbogen (Lokaal is pretty good) walk cross the train tracks using the ‘Luchtsingel’ while looking back at the hip hop inspired mural by Opperclaes XL. Street art can also teach you quite a bit about the place you’re visiting. Two murals that can teach you a little about Rotterdam are near the Maritime Museum. Artist collective Lastplak created a giant, colourful and cartoon like mural, and it’s pretty easy to make out typical Rotterdam icons like Euromast, the cubic houses, Erasmus bridge (which has been nicknamed The Swan) and Rotterdam harbour. 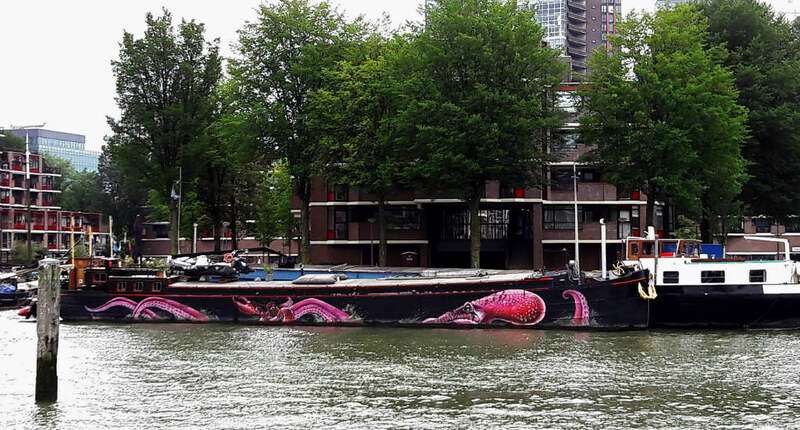 Around the corner, the Leuvenhaven quay offers some excellent views of impressive ships, shipyards and bridges and it’s also the place where Vinz and Doppies’ Monster of Rotterdam lives on the side of a boat. 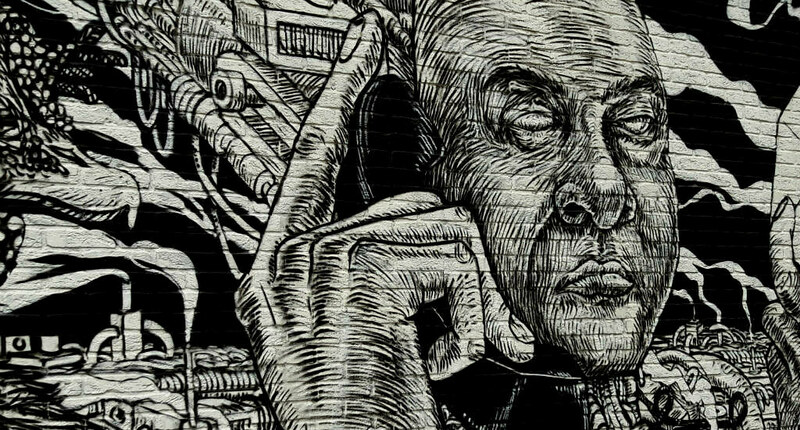 I often find black and white street art even more powerful than the brightly coloured works (I am a huge fan of ROA) and Rotterdam based Bier & Brood collective has definitely put its mark on the Rotterdam street art scene with its highly detailed, large black and white works. On Baan Bier & Brood covered an entire building, named ‘The last research’, referring to the old days when the building was used by an organisation testing food products. 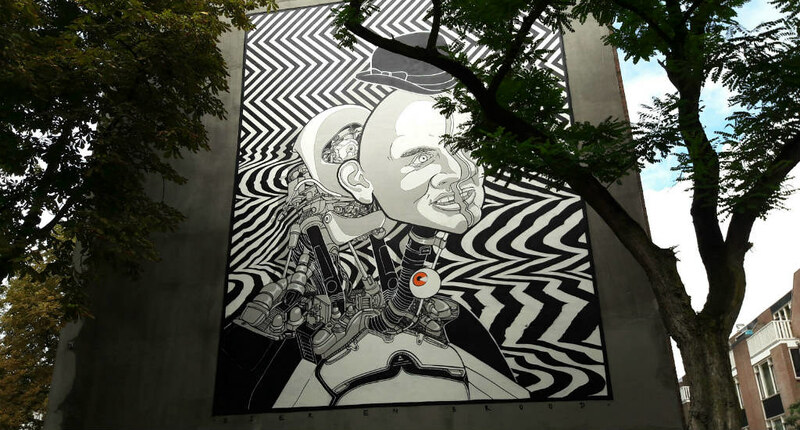 Near Witte de With (where you have excellent lunch and drinks options), Bier & Brood are the artists behind the mural Metamorphis, which was inspired by the movie A clockwork orange in which villain Alex turns into a model citizen. The work depicts Rotterdam morphing from a city with challenging neighbourhoods to a must-visit destination. If you follow me on Instagram (come say hi if you like) you have probably seen this guy all over my feed. Simply, because I like his work so much. MeLikePainting is Tymon Ferenc de Laat, a well-known Rotterdam artist, whose work is inspired by his travel through South America, as you can see from his portraits Horizonte and Mr. Merida. Fun fact: Tymon used his work ‘Love Birds’ which he made together with Robert Rost, to propose to his girlfriend. And I am happy to report (as I basically couldn’t help myself and asked Tymon on Instagram) that her answer was YES! 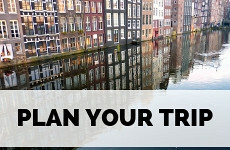 You can fly to Rotterdam from many destinations within Europe and flights are often inexpensive. 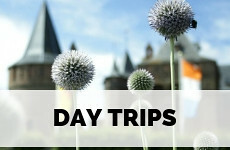 Find cheap flights to Rotterdam. From the airport, take the metro into town. Trains run regularly from to Rotterdam from Amsterdam, and even from Antwerp, Brussels and Paris. Check tariffs and timetables here. 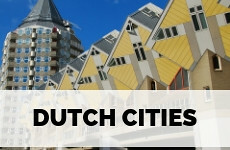 Rotterdam is a rather widespread city, so you’ll probably want to use the tram and metro to get around. Buy and charge an OV Chip Card to use public transport. 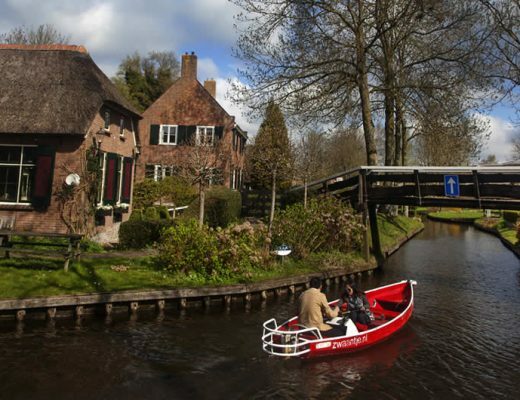 If you’d rather explore Rotterdam by bike, I highly recommend this guided bike tour. 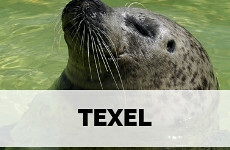 Looking for a nice hotel in Rotterdam? I can highly recommend the Citizen M, centrally located near Blaak. 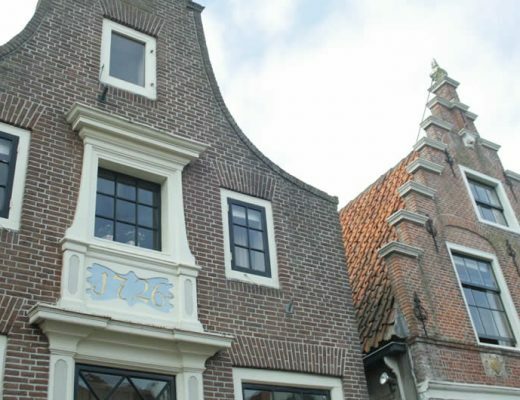 You can read about Blaak in my article about 3 bustling Rotterdam neighbourhoods. I’ve also written an article about Rotterdam for art lovers. 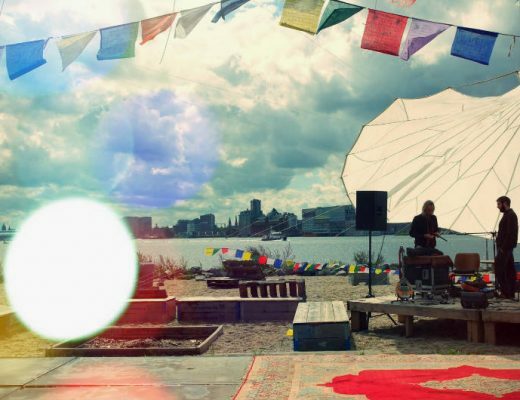 Check out all must-sees and hidden gems in my city guide Rotterdam. What’s your favourite city to spot street art? Hi ESTHER, it is always good time to read your blogs because your blog has amazing photographs that attracts me to follow your blog… Keep going on. What unique pieces of work! Love Street Art!! Will have to consider a trip there just for the art work! I have never heard about such a great street art in Rotterdam and to be honest I didn’t even see why to visit the city. But your picture got me, now I really want to see Rotterdam. The street art looks beautiful! I have really been into street art tours lately. I didn’t realize how much I was missing on the meaning of the art before I started taking the tours. 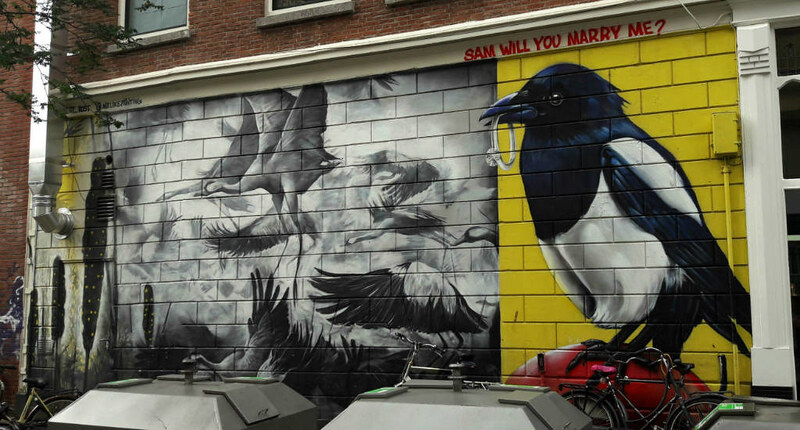 Would love to do a street art tour when I make it to Rotterdam. I know, I have been completely obsessed since discovering street art in South Africa in 2014 . Ever since, I search for it everywhere I go. I think it’s a big bonus if a city has a street art route of some sort. 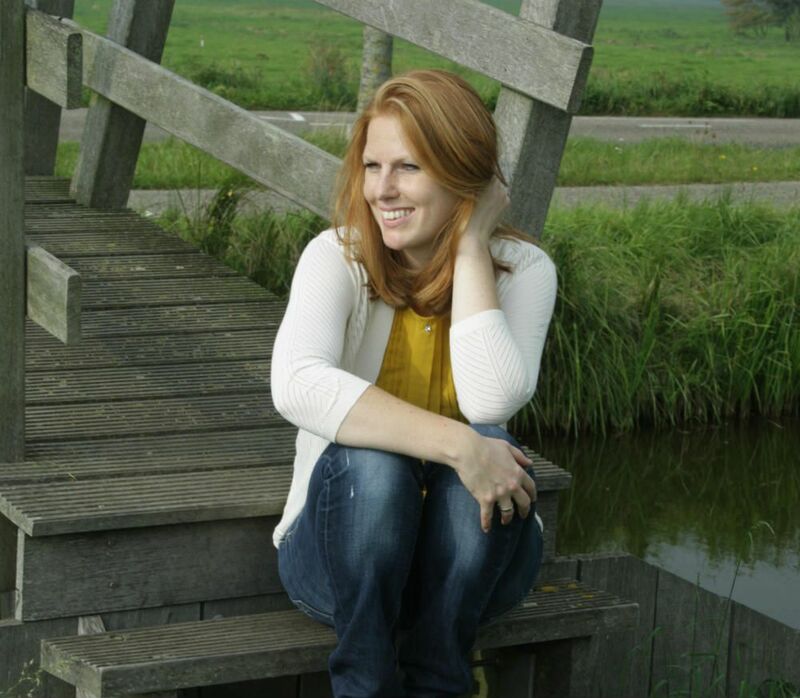 It’s so interesting to read your posts about Holland. I always wanted to go visit some of these beautiful European countries, but when I lived there (during Communism) I couldn’t do it. I love street art and Rotterdam seems to have indeed some very beautiful examples of it. Hopefully I’ll make it there someday. Wow – those Bier and Brood pieces are incredible! You’re right, I haven’t really thought of the Netherlands as a place for street art, but hip Rotterdam is clearly leading the way. I need to visit! Isn’t that incredible that he proposed that way. How romantic. Love all the different photos and great to consider this as a way of really getting into the heart of a city. That’s so cute, the proposal! Yes, I know right! I immediately had to find out what she said, but how can you say no after such a proposal! These are some seriously amazing pieces! I love the variety that you got to see, I love how street art displays so much talent. It’s the best!! I like street art for many reasons, but the variety in pieces, stiles and size is definitely one of the reasons! Wow, that’s so cool! Love the pieces you’ve showcased, although unlike you I actually prefer the more colourful ones. I took a street art tour in Bogota recently and it really opened my eyes to the world of street art. Would definitely be up for this! I’m reading so many more articles now about street art all over the world and you’re right, it’s a brilliant way to give life to neglected parts of cities as well as using art to showcase a city’s style and culture. There are some very striking pieces here – I think my favourite is the monster on the boat! 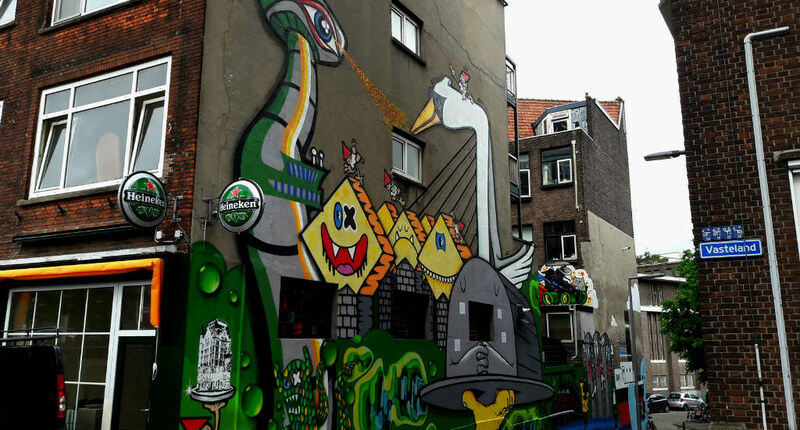 Rotterdam may be a bit late to the street art thing – but they’ve certainly made up for it in talent! What absolutely fantastic artwork! 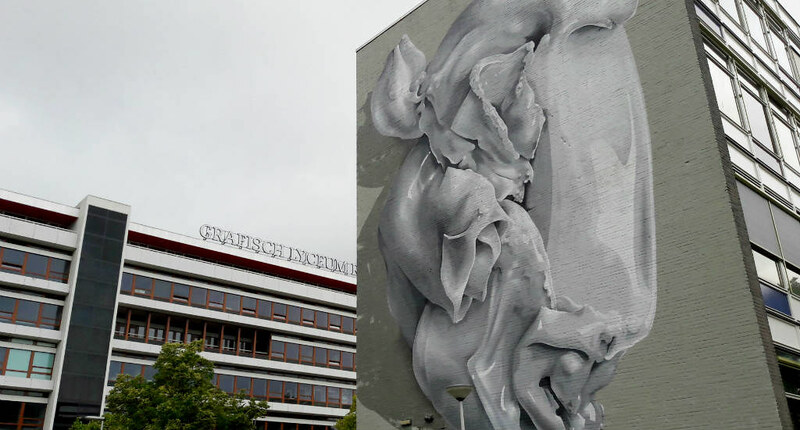 It is amazing how street art has suddenly exploded almost from nowhere to go from eyesore to official tourist attraction – Rotterdam may not have been first, but it’s certainly not behind when it comes to quality. I love the idea of the tour as well, and the chance to use that to discover the city as a whole. 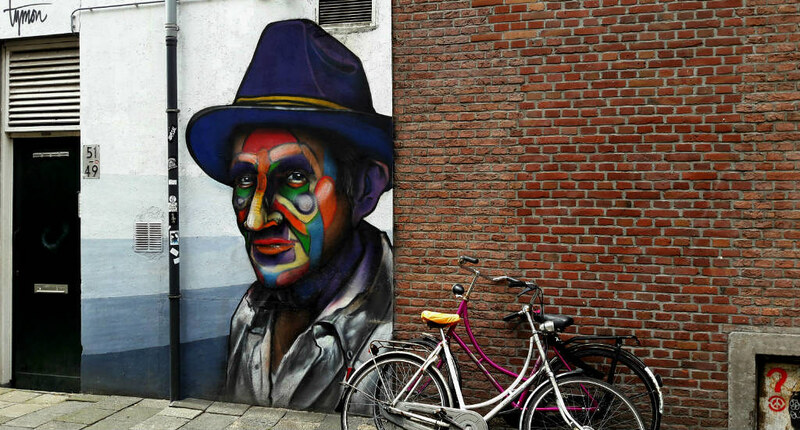 Hopefully I will make it to Rotterdam one day… I’m a huge fan of street art! Great photos! I love that street art is becoming so popular! There’s TONS to see in LA too, so if you ever visit you’ll have to do a street art tour downtown and in Venice! I love Street Art! The different expressions in each piece make the experience incredible and original with each mural. We live in Delft, so I need to go check this art out. I can’t wait to follow you on Instagram and see what you find next! Hey Elizabeth, thank you for stopping by! 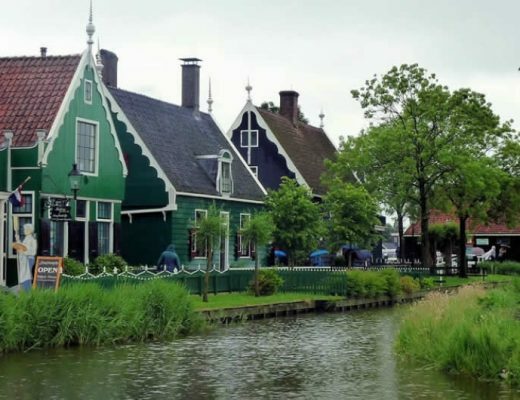 How great that you live in Delft. I hope you’ll stop by again if you need more advice on what to see and do! Love the idea of a street tour! This is awesome! Thanks for your recommendation, Esther!